People do not naturally expand their scope of influence. Even entrepreneurs are not naturally good at self-promotion. This is a proactive art form that only about 10% of people do really well. If you want to spread your message to a relevant group of people — let’s call them readers — you must start with your own network and validate your idea. This means you strategically share it with everyone you know — online and offline. This is where self-promotion comes in. It should come as little surprise to authors that book sales are directly linked to their own effort and commitment to success. Authors are the center of their own worlds; of their own expertise and influence among their peers; and, of course, their own book projects. If you think people won’t be interested in what you’ve written, then you’re not ready to become a bestselling author. So get out there and hustle. I believe that people who inhabit the earth should follow James Altucher. His advice is applicable to anyone who wants a humble approach to a happy life. It’s also very applicable to book authors. Here is all the advice I’ve gotten in the past few days. I collect advice and try to figure out what to do with it later. This is all decent advice. I don’t know. I’ve never done any of it. BUT, I can tell you what is common among all the people who gave me the advice. Their network of contacts is huge. They stay in touch with hundreds of people and then when the time is right, they know how to put the right people together and they get a cut in the middle. Sometimes the cut is a million dollars or more. I try to add one person to my network every day. Maybe today I will add you. Successful book authors have a mindset to build a platform first, sell books second. Tom Morkes, Author of Collaborate and renowned book launch expert, says the fastest path to respect, attention, and profit is by positioning yourself as an Authority. What he’s talking about is called a platform. Every Authority has a platform where they share their great work, says Morkes, a place for their biggest fans to interact with one another, and a space from which to instigate the support of their biggest fans (when the time comes). Tom Morkes has helped authors such as John Lee Dumas and Scott Bales reach new heights by leveraging their Authority to obtain A LOT of book sales. Bottom line: You can have the greatest CONTENT in the world, but if you don’t have the right place with enough people to SPREAD THE WORD, it doesn’t matter. I agree with Tom Morkes that crowdfunding offers a way to validate your book idea before writing it and querying publishers. 250 is the minimum amount to do this. It ‘validates’ your book to publishers and also guarantees that you’re funded enough to comfortably self-publish in the event you don’t land a deal with a publisher. This is smart. Because it allows you to plan for the best case scenario (a publisher), but you’re covered if you don’t get it. Major publishing imprints love the idea of preorder sales because it shows traction for your book and that you’ve been able to generate some demand. They will happily fulfill your preorders in their distribution channels if your proposal is compelling enough. Step 1 is getting them to notice your book. 250 is the minimum number that good publishers will start to express interest in. And the more presales you get, the more publishers you’ll see expressing interest. 250 is also a feasible number for entrepreneurs and business professionals who have a platform and an email list of about 5,000 subscribers. If just 5% of them preorder your book, that’s 250 copies. And sometimes it doesn’t take 5%. Sometimes it takes a couple major sponsors, partners or clients to push you over that minimum. The rest of sales are bonus and add dollars to your pocket while getting your message into the hands of your target audience. Jeremiah Gardner, Author of The Lean Brand and CEO of Move The Needle, had some success integrating his book sales with his branding services and landing some major sponsors. Etsy, the reputable peer-to-peer e-commerce website, took them up on their $1k reward. They became a sponsor of the book through a high-hurdle experiment Jeremiah ran trying to connect with his audience prior to launching the campaign. Long story short, Etsy’s creative director had joined their mailing list and participated in the experiment by printing out a poster provided during the campaign and then hanging it on the office walls at Etsy. The $10k sponsor was Ericsson (Jeremiah’s co-author, Brant Cooper, had to use his credit card to get it in the timeframe of the campaign, as their finance department was mailing the check). They were supporters of Brant’s previous books and wanted both of them to come give a keynote and book signing during their Innovation Summit. “These were both pre-existing relationships,” he said. “We approached two of our top clients with the opportunity to engage us for training at a discount, along with other perks, and the offer was valid only during the book campaign. One of them said ‘yes’! According to New York Times best-selling author and lean startup pioneer Brant Cooper, there’s one thing that startup founders need to be constantly doing above all else: Hustling. Brant Cooper is the Author of The Lean Entrepreneur and Co-author of The Lean Brand with Jeremiah Gardner, amongst others. He knows that short term growth — for founders and authors — is about hustling. That doesn’t mean tricking people out of their money. That means figuring out who will benefit from your book and your pricing packages the most, and then figuring out the shortest and quickest route to making that happen. Make it a full-time job. You can’t just ask for money and then walk away. Carefully track your campaign to answer questions and stay in touch with donors. Haarburger tracked his contacts and interactions with spreadsheets, which ensured he was taking consumer feedback into account. Social media can be a great platform for authors to use if they are active enough and their following is engaging with them. 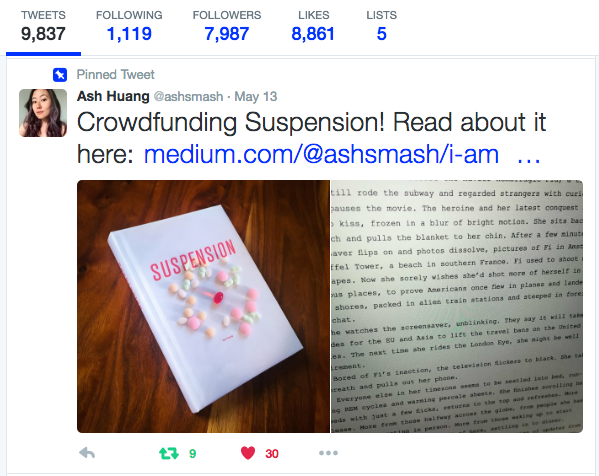 Ash Huang, Author of Suspension crowdfunded her way to 185 book orders in less than 10 days, about a hundred of which came from her Twitter and Facebook following. This is a solid amount of sales from a social following — and it’s very uncommon. Ash Huang posts very unique and sometimes quirky posts that her followers love. They are sold on her as a writer and will read anything she puts out there, including a book. Ash Huang is in that 10%. BUT, we have consistently seen other authors with large social followings who did well in book sales, but almost no sales came from social media. Social media is an indicator of author influence and how big their platform is but is not an indicator of book sales. her pricing packages which she proactively sold to her clients and sponsors. She also pitched private talks to co-working spaces and large executive teams about side hustles and publishing hacks at their own place of work. Of course, she would also bring along 30 copies of her book to share. These authors hustled their way to hundreds of book orders with thousands of dollars attached to them. Again, social media wasn’t a huge factor. Scott Bales obtained 1763 preorders for his book, Mobile Ready, with 5,000 followers on Twitter. Not a huge amount, but enough clout to establish himself a thought leader in his own space. Bales talked about his book to everyone who would listen — online and offline. Hundreds of his sales came from single purchases of people who inspired by his message and wanted to hear more from him. He also got sponsors to preorder bulk packages, which means he pitched virtual and on-site Keynote packages to corporate executive teams to train their employees and conferences who’s attendees would benefit from his book. He simply wrapped his book sales into these higher priced packages. He also crowdfunded his second book, Innovation Wars. He describes his publishing experience here. Clara Pang, Author of The Sun Sets Anywhere had some of the most creative pricing packages I’ve seen. She also made sure that no package went unsold as she ran down her list of contacts, clients and partners to sell them directly. From Holiday Gift Bundles and Free Shipping to Patron Sponsors and Planning your next trip, and then giving acknowledgement in the book every step of the way. She had about 40 followers on Twitter when she started. Write down a list of every person you know who would buy one copy of your book. Create a package for them, explain why it’s specifically for them and then share it directly with them. Then write down a list of every client, organization or sponsor that could preorder bulk copies of your book. Create a package for each of them; price + extras like keynotes, 1-to-1 sessions and acknowledgements inside the book. Explain why it’s specifically for them and then share it directly with them. Do this until you know you have at least 250 copies of your book presold — before you even launch your book campaign. Jon Yongfook, Author of Growth Hacking Handbook, shares how he growth hacked his way to 496 preorders in 3o days. He did a lot of things. You can read them here. Factor your market size into pricing. It was $25 to preorder the book. The Growth Hacking Handbook is aimed at tech entrepreneurs who have heard of growth hacking. It’s pretty niche. I don’t think I could have reached the $10,000 goal in a month by selling it at, say $10. One can argue that $10 may have fueled more impulse purchases but in the end I had to make a judgment call as to whether I believed those impulse purchases would offset not selling it at a higher price. I decided to go with the higher price. He also recommends tweeting up to major influencers to RT, guest blogging in major publications, designing a very simple book cover, having a teaser page — which can also be a website like CLOnow.com or readsuspension.com. He also says he wishes he would have created a video for the book campaign. We highly recommend starting at $20/book and then working pricing packages up from that point. At $20/book you can 1) attract a lot of single copy orders because the pricing point is at or below standard non-fiction book pricing, and 2) set yourself up to fund your own self-publishing if need be. $20/book x 250 minimum copies = $5k. That’s a good advance. And you haven’t even finished the book or starting querying publishers. It means that successful authors spend the first 5–10 days selling the first two bundles (125 copies and 250 copies) to sponsors and then fill the rest of their time utilizing their email subscribers to fulfill the third reward option for individuals. 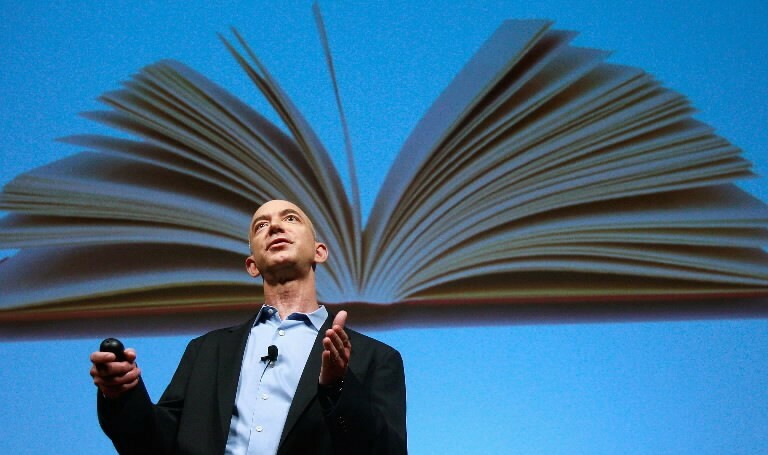 This also means that ebooks don’t usually move the needle for sales. Instead, they are used to build your platform and establish you as an Authority on a specific topic. I’ve said before that press doesn’t move the needle — and it doesn’t for authors who use it as the main way to obtain sales in the short term. But there are a two ways that really help authors get their message in front of potential readers and grow their following. 1) Consistently write for major publications. Share your knowledge and hacks with Inc., Huffington Post, Entrepreneur, TIME, New York Times, Business Insider or any other outlet that establishes you as a thought leader and specific topics. It takes some pitching to get in these publications, but once you do your writing will be seen by a large group of relevant readers. E.g. Dave Kerpen writes consistently for Inc. and spreads his message to prospective clients and business leaders — who will be likely to buy his next book. Read his articles and buy latest bestselling his book. Get some traction — and lots of recommendations — and then share your best articles with major publications. If they are good enough, they are likely to get picked up and shared. Share insights, share curated lists, share sample chapters, share anything relevant. Kristyna Z., Jon Westenberg and Heidi Isern are all very good at this. Kristyna Z. gets hundreds of recommends on every blog she posts and is rapidsly becoming an expert on mindful entrepreneurship and the best apps entrepreneurs can use to bootstrap their own business. She’s also shared sample chapters from her upcoming book and excerpts that have gotten picked up by TIME, The New York Observer, Business Insider, The Next Web and many others. Jon Westenberg is a writing machine. He posts on topics relevant to his expertise and gets hundreds — sometimes thousands — of recommends on his articles, which he shares all across the web. He commands attention and curates the best stuff out there. His stuff has also been in Huff Po, Observer, Upworthy and others. Heidi Isern has some ridiculous writing on all things relates to life. She’s also Business Development @IDEOand occasional startup advisor. Whatever that means. But she’s growing her platform because of the great content she writes and shares with a niche following. Her stuff has also been in Huff Po. (Here’s the Medium version). How cliche. But how true. The more unique and the more niche you are, the easier time you’re going to have building your platform. Once you find your people, or your tribe, you can tailor your message specifically to them. Your uniqueness stems from your target audience. Well, easier said than done anyways. For most people. Remember that 10%? Janet DeNeefe is also included. This is usually done the opposite way, however: You discover a need or a problem that your target audience has. And then you write a book on how to solve the problem. Or you provide relatable and actionable theories on how to solve the problem. This is often less than an agent does. Although, not a difficult feat when you have “a unique and exotic story” — another criterion she stressed as necessary to catching the attention of publishers. (Also the same reason she didn’t think it necessary to hire a lit agent). Janet DeNeefe is a unique story in it’s own right. Her advice, however, is not. You have to be unique. Publishers are smart. They know that in order to have standout success, a book and it’s author need to be unique because that’s what people want to read. Selling your book may seem a daunting and overwhelming task that you takes time and savvy skills of persuasion. But fix Pre- in front of sell and things become manageable and less stressful all of a sudden. Validating your book idea does not mean writing your book. Pre-selling your book does not mean crafting marketing campaigns to scale to the world. Querying publishers does not mean more time away from your business. It does mean treating your book like a startup, reaching 250 copies sold and creating a proposal that publishers want — with as little disruption to your daily life and business agenda. Some are better at persuasion than others, but the smarter you are at building and leveraging your platform, the less you have to ‘persuade’ anyone to do anything. Here is how to Sell Your Book Using a Laptop. Here is how to raise funds for your book before approaching publishers and lit agents.